We are the well known a trader, wholesaler and supplier of a vast assortment of optimum quality Color Coated Profile Sheet. This profile sheet is manufactured using quality tested metal and cold-rolling technique. Our offered sheet is made available in variegated colors and sizes for our clients to choose from. Apart from this, provided sheet is strictly tested on various parameters in order to ensure its flawlessness. Clients can purchase this sheet from us at pocket friendly prices. 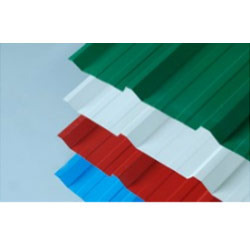 Established in the year 2013, Nashik (Maharashtra, India), we “Sky Roofing” are a leading Manufacturer, Trader and Supplier of an exclusive range of Profile Sheet, Air Turbo Ventilator, Roofing Sheet, Roof Forming Machine, Hexagonal Head Screw, Crimp Sheet, Color Coated Sheet, Corrugated Sheet, Galvanized Sheet, Tile Effect Sheet, Solid Polycarbonate Sheet, GP Sheet, GI Sheet and many more. We manufacture these products in accordance with set industry norms. These products are highly demanded in the market for their features like high strength, temperature resistance, sturdiness, low maintenance, high performance, durability and weather proof. Our products are manufactured using high quality raw material and cutting-edge technology under the strict surveillance of our skilled professionals. The raw material which is used to manufacture these products is sourced only from the certified vendors of the industry. These products are sourced from the reliable vendors of the market.